Famous people born on AUGUST 25 are Virgo who one could say have a low tolerance for pettiness and child’s play. They work hard… too hard for their money to be involved in anything that could jeopardize their outstanding reputation. Sometimes it can take days for them to come to a conclusion about something significant. Additionally, these famous August 25 celebrities can make a mountain out of a mole hill. So they are actually responsible for creating their own crisis from time to time. Otherwise, they are normal within a healthy range of self-reliance and integrity. 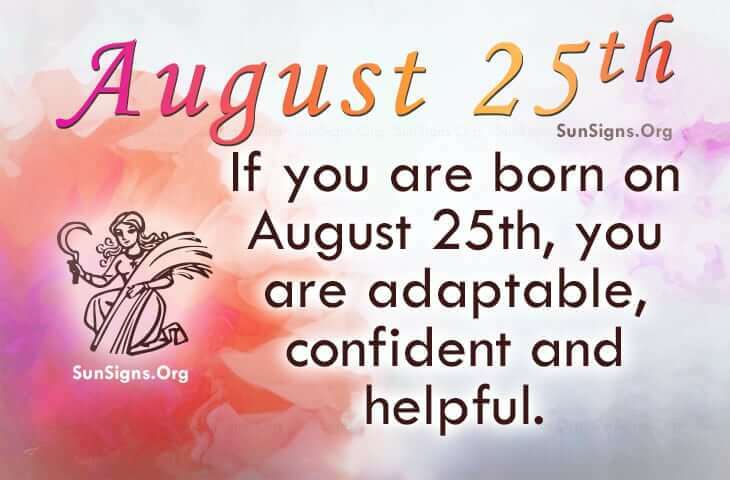 But as a shortcoming or downfall, famous people born on August 25 tend to worry and stress over many things beyond their control. Try meditation as a means of exercise and relaxation. It could help relieve stress tremendously. This should help clear their mind so they can better help others. Being the nice person that they are, some expect them to be vulnerable as well. Famous people born on August 25 have great instincts when it comes to people. So it’s unlikely that they will let people take them for granted. As their own boss, they will likely give some of the load to other professionals. They don’t seem to have much control when it comes to a sale. Chances are they make impulse buys. Famous AUGUST 25th celebrities can be rational people with a lot of potential to be great. They are adaptable, confident but they can be their own worst enemy. However, they are generous and don’t mind helping others in time of need. This is their gift.